From High Street to High End, Zalando has all your favourite brands in one place. Find the latest styles and freshest fashion insight on Zalando.co.uk. Browse Zalando’s assortment of over 1,500 brands and check out the News and Style section for trend guides, outfit inspiration, street style and more. With free delivery and returns, finding what you’re looking for couldn’t be easier. How to redeem your gift voucher 1. Choose what you want from over 1,500 top brands. 2. 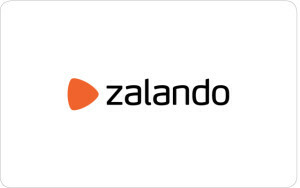 Log into your account at Zalando.co.uk or in the Zalando app. 3. Click on your account and enter your gift voucher code in the 'My Vouchers' section. The gift voucher amount will be instantly credited to your account. Alternatively, you can enter your gift voucher code during step 2 or 3 of the checkout process in the 'Do you have a voucher?' field provided. If you do not use the total gift voucher amount in one go, the remaining amount will be credited to your Zalando account. For more information check out our Terms and Conditions at zalando.co.uk/zalando-terms.